Bradford was founded in 1876. We not only have a thorough understanding of the personal care industry - we helped revolutionize it! Our experience is the key to your success. The name has stayed the same, but the industry is always changing. We help our clients set the trends by leveraging our market research and our R&D. Bradford has achieved many sustainability milestones. We are the first soap manufacturer to be Certified Organic and the first company to offer Rainforest Alliance Certified personal care products. Want to keep up with the latest industry trends? visit our Blog or subscribe to receive Blog updates. 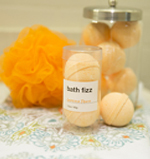 Bath Fizz Frenzy- Bath fizzes have been a fast-growing trend – regardless of where you shop, it is hard not to see them everywhere. The combination of playful fizz, fun fragrances, and skin-softening oils makes it easy to see why they have been such a success. Bradford has invested in equipment that will allow us to automate the production process for ultimate product consistency and efficacy.